The horses feet are turned away from each other. Causes winging motion that may lead to interfering injury around fetlock or splint. As the horse wings inward, there is a chance that he may step on himself, stumble, and fall. 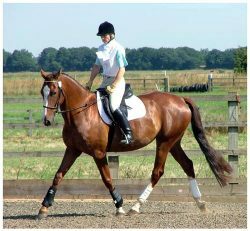 A horse that is tied in behind the elbow – has restricted movement of the upper arm because there is less clearance for the humerus (it angles into the body too much). Reduced clearance of legs causes horse to toe-out to compensate. Toes of hooves face in toward each other. Pigeon-toes place excess strain on the outside of the lower structures of the limb as the horse hits hard on the outside hoof wall. Often leads to high or low ringbone. The horse is predisposed to sidebone and sole bruising. The horse moves with a paddling motion, wasting energy and hastening fatigue so that he has less stamina. The feet are closer together and more under the body than the shoulders. Stresses the outside structures of the limb, especially the outside of the foot. Causes a winging motion, leading to interfering. Predisposes the horse to plaiting. The horse tends to hit himself more when fatigued. Excessive strain on the lateral structures of fetlock, pastern, and outside of hoof wall. Causes the horse to paddle. The horse lands hard on the outside of the hoof wall and places excessive strain on the medial structures of the fetlock and pastern. Can potentially sprain the structures of the carpus. The horse will wing in, possibly leading to an interference injury or overload injury of the splint bone. The horse lands hard on the inside hoof wall, placing stress on the medial structures of limb. The horse will paddle. With a plumb line from the point of buttock, the lower legs & feet are placed more toward the midline than the regions of hips & thigh, with a plumb line falling to the outside of the lower leg from the hock downward. Usually accompanied by bow-legged conformation. A fairly common horse hoof conformation fault, particularly in heavily muscled horses like Quarter Horses. The hooves tend to wing in, so the horse is more likely to interfere. If the hocks touch, they may also interfere. The horse will not develop speed for rapid acceleration. The outside of the hocks, fetlocks and hooves receive excessive stress and pressure. This leads to DJD, ligament strain, hoof bruising and quarter cracks. The horse is best for non-speed sports an those that don’t require spins, dodges, or tight turns.